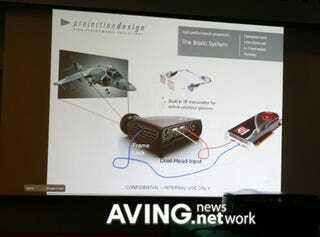 A new DLP projector by Projectiondesign promises not only a 1080p image at 60Hz, but one that you can watch in 3D. But it's no simple feat. While most normal DLP projectors simply shine light through a color wheel, this projector is driven by an unconventional two imaging chips (one for the left eye and one for the right) that each take turns controlling color wheel rotation.